When someone mentions a paradise island we all think of the same thing: clean, white sand and clear blue water. Like everyone else, I’ve always wanted to stay on my own paradise island – just like the one in the postcards. Honestly I thought I’d have to wait until I made it to the Maldives or the Seychelles, but then someone told me about Koh Rong Samloem in Cambodia. After spending four days in Siem Reap exploring the ancient civilisation of Angkor Wat and the surrounding temples, I boarded a quick 30-minute flight to the coastal town of Sihanoukville. From here, I caught a ferry to Koh Rong Samloem. 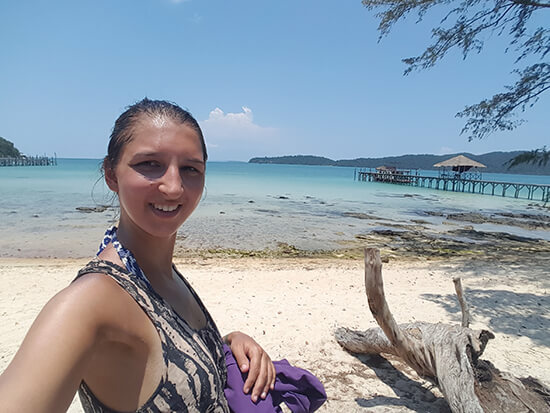 I had heard a lot about Koh Rong, Cambodia’s notorious party island, but it was only by the words of other travellers and their beautiful pictures that I found out about the quieter and lesser-known Koh Rong Samloem. As the ferry motor slowed to a low hum, I picked up my bag to complete the unglamorous task of hauling myself onto the pier. I rushed past the crowd of people who had mistaken Koh Rong Samloem for Koh Rong, and felt smug as the majority of passengers returned to the boat, leaving the beautiful scene ahead to me and a handful of others. Dropping my luggage off at one of the beach bungalows I then rushed out out on to the nearby beach called Saracen Bay. I literally gasped at the sight. This was the paradise island I had been promised. The white sand squeaked it was so clean and felt like soft – albeit burning – pillows beneath my feet. I was in Cambodia during the country’s peak summer season, which meant it was hot, unbelievably hot! Just as a side note: the best, less scorching, time to go to Cambodia is November-February, not April, like me. Fortunately, the sea was so clear and shallow I managed to lie in the water to cool off while reading my kindle. The water was blissfully calm, and the only time the waves rippled was when a rare fishing boat or ferry came in. Yes, this would do very nicely. Looking up from my book and out onto Saracen Bay it was what I imagined the busier beaches of Sihanoukville once looked like. Only a small scattering of wooden bungalows blended in with the scenery, some higher up on the hillside, others on stilts facing out to sea with a huge window at the front, an open-air dorm for those on a budget, and of course my small bungalow nestled in the sand opposite me. Sometimes the best thing about a beach break is having nothing to do. And by this I mean topping up the tan, having a snooze on the beach, drinking a cocktail at 2pm and devouring pages of all the books I had been meaning to read. 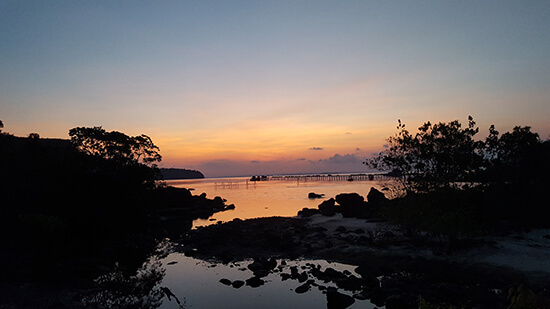 The peace and quiet of Koh Rong Samloem was the perfect place to do just that, with nothing around to distract you. When I did decide to stretch my legs, I took one of the shorter trails through the nearby jungle. One time, I saw a wild monkey jumping and swinging in the trees overhead, with his companion determined to stay hidden as it rustled in nearby bushes. I stayed hushed in the shade of the big overgrown trees, hoping to catch a glimpse. There’s also the opportunity to book diving and snorkelling trips that pick you up from the island and take you to see nearby coral reefs. I don't know much about the reefs in Cambodia, but I imagine as they are little-known they have been left beautifully untouched. Next time, Koh Rong Samloem, next time. If you're inspired by Helen's Cambodia holiday, why not try one of our tailor-made Cambodia Journeys, such as the Cambodian Explorer from £1,739pp?